The proposed development of up to 140 houses is not required in our area (Trowbridge remainder). Please refer to Wiltshire Council’s Housing Land Supply Statement Table1: Housing delivery compared to annualised requirement (page 6) and appendix 6 – Summary assessment of supply and remaining housing to be identified (page 101). Southwick has already exceeded its duty in terms of contribution to housing in the region. Being part of the Trowbridge Community Area Remainder, it has an indicative requirement for years 2006 - 2026 of 165 new homes, with 242 completions to 2016, leaving an indicative remaining requirement of zero new builds up to 2026. Looking at the broader picture, North and West Wiltshire have exceeded its five- year land supply (5.73 years vs. 5.25 years target). Building of an additional 140 new homes on this site would be superfluous and contrary to CP1, CP2, CP51, CP57, CP60, and CP61 of the Wiltshire Core Strategy 2015 and the policies of the NPPF taken as a whole.” So why is Southwick being targeted and having imposed upon it, the building of another 140+ new homes on precious open greenfield/farmland located outside of its existing settlement boundary? There is absolutely no justification for this. Also, Southwick has already expanded significantly during recent years within its settlement envelope. By Wiltshire Council’s own figures, Southwick is already above target in the amount of affordable housing it has created in the village. Developments on the old Mowlem site, Lewis Court and Swan Court plus smaller ‘in-fill’ development are evidence of this, producing 77 new affordable homes in total. 21 of these homes were planned for local people in the village. Just one was allocated on The Mowlem’s/Swan Court site to a local resident and again just one in Lewis Court. Southwick is a village, not a town. My understanding is that Southwick is classified as only suitable for small-scale developments that are required to meet local needs. I hardly consider the construction of 140+new homes in this location as ‘small scale’ and Gladman have failed to submit with their application anything to support their claim that there is a demand for further housing in Southwick. It is absolutely clear that Southwick does not have any demand for new housing and therefore does not need to build any new dwellings to satisfy local need. Core Policy 1 - Southwick is a village with very limited infrastructure, employment and general services and should be considered unsuitable for large-scale housing developments. Further large-scale developments would put already inadequate services under even more pressure. This would fall contrary to Core Policy 1 – par; 17 of the NPPF and does not meet the housing needs of Southwick. There are very few, if any, employment opportunities in Southwick. Houses built on these sites would only serve to attract buyers from outside of the village. We would then be in the ridiculous situation where houses built on this site for people to move into the village, only to travel significant distances every day to secure employment. Southwick would become a dormitory village/town, impacting the community. Public transport is identified as being good or sufficient to support amongst other things commuting to and from work, The limited bus service in Southwick may cater for very limited daytime core employment but there is little or no public transport availability post 17:00 for shift working, night working and late service sector staff working shifts, all of which are prevalent employment types in the Trowbridge area. Access to and use of a car is essential for movement to and from Southwick. In the absence of a full and comprehensive public transport support system, this development would only serve to increase the volume of vehicle traffic on local roads. In this respect, can someone please explain the point of building more and more homes in Southwick? If people have to commute across Wiltshire for access to the M4 corridor and major rail networks in order to get to work. I would ask what kind of community would this activity engender in Southwick? I suggest it will have a detrimental impact on its core fabric, affecting the general feel of the village, somewhat of a transient and semi permanent population. There is Zero Demand for Additional Housing in Southwick: Contrary to the unsupported statements made in Gladman''s literature, Southwick does not have any immediate need for additional housing. Southwick will build a small number of new affordable homes over the next 10 years, based on need and targeted to appropriate socio-economic groups and as part of its own Neighbourhood Plan. In this respect, other available sites in Southwick, especially Brownfield sites, will be considered for development purposes first; long before we have any need to consider this site for development purposes. Any housing development on this site would be in-fill between settlements and would be in direct conflict with Wiltshire''s Green Infrastructure Strategy. Core Policy 29 – Also advises that open countryside should be maintained to protect the character and identity of Southwick as a village. Core Policy 2 – This proposed development site is outside the limits of development for Southwick and has not been identified for development through the Site Allocation Plan. If a Planning_Decision were taken by Wiltshire Council to allow this Planning application to proceed, it would be in breach of Core Policy 2. Also, to impose this housing development on the Southwick community, when there is no demand for housing would also conflict with the Localism Act 2011. The development breeches a long recognised boundary, which has always been considered as the village limits. By allowing this development to go ahead would set a precedent, the consequence of which would be additional large scale development in the village, either now or in the future There have applications for smaller scale developments outside of the existing settlement boundary in the recent past. Wiltshire Council has refused all these. Precedence has therefore been set. It would be inequitable and biased if this precedence did not apply to Gladman or any other large scale developer looking to consume land outside of the existing Settlement Boundary. My concern is that If Gladman were granted permission to build on this site; it would open up the ‘flood gates’ for new planning applications outside of the current Settlement Boundaries of Southwick. In this respect, we are already seeing two other large scale developers ‘lining up’ to submit their planning applications, the main one so far being an application for residential development of 100+ new homes on land south of Blind Lane (16/12279/OUT) and on land East of the 361, South of Trowbridge, by Savills on behalf of Waddeton Park Ltd. for 280 new homes. If all three proposals were granted planning permission, the number of homes in Southwick and area landmass that they cover would increase by over 33% Urban sprawl and in-fill would be consequential!! This attractive open site is part of the very fabric of the community. Building residential housing on it would completely destroy the amenity of the village. Any sort of housing development on this site would create a detrimental visual impact on the neighbourhood and a detrimental impact on the village, when compared to what we have now. The balance of the village community and cohesive nature of the local population would be put at risk. The village sense of identity will be eroded as the population expands and Southwick becomes just another suburb of Trowbridge. The development would alter the general feel of the village and it would no longer have the same visual and spiritual appeal. I would point out that Southwick has already seen a loss of Greenfield and amenity with the consent to install at least two large solar farms within its boundaries. Any further dilution of natural amenity would be totally unfair on existing residents. Increased light pollution. In this respect, Southwick currently enjoys the benefit of ‘big skies’ both during the day but especially at night. I have experienced some fantastic evening and night skies to the front aspect of my property, full of stars and un-adulterated by human sourced light pollution. I have even been able to track satellites and the Space Station by eye. These big skies in Southwick will be a thing of the past if this development is allowed to go ahead. Nocturnal wildlife will also be adversely impacted by light pollution, especially the rare breed of bats that use the site as their home. Campaign for the Protection of Rural England (CPRE) has published a new detailed picture of England’s light pollution at night using satellite date captured at 1:30am throughout September 2015. Nationwide, they show that just 22% of England is untouched by night-time light pollution. This research comes at a time of increased awareness of the harmful effects of light pollution of people and wildlife. In addition, Local Councils were estimated to spend £613m on street lighting in 2014-15. Those lights account for between 15-30% of a councils carbon emissions. Loss of Wildlife. Residents would no longer be able to freely enjoy the natural wildlife, including deer, rare birds of prey, foxes, badgers, nesting birds, bats, newts, slow worm, grass snake, water voles, etc., etc. that is so abundant on this site. The quality of life for existing residents and their visitors would be adversely impacted. Villagers and visitors use these fields extensively for recreation purposes alike. Activities include walking, jogging, cycling, horse-riding, bird watching, artistry, etc. etc. People require places to enjoy and not just a roof over their heads. The additional traffic created by allowing this development to go ahead would not only affect the amenity of the village, but also put these groups at much greater risk of accident and injury. Government policy and its directive to Local Authorities still remain not to allow development on Greenfield sites. “The Government supports building on brownfield sites and not greenfield sites" This is official Government policy as demonstrated by the Government going ahead with its new garden towns and villages programme where brownfield sites are being prioritised for the development of 200,000 new homes across the UK. More recently, media coverage (Peston on Sunday 5th Feb ITV) and a Government White Paper supports the conservation of Greenfield. Southwick has already been forced to give up large areas of Greenfield following Wiltshire Council’s Planning_Decision to allow the construction of two solar farms in the village. Both of these sites are visually detracting, spoiling the open countryside. It would be unfair to expect the residents of Southwick to have to sacrifice more Greenfield, especially as it does not need any further housing to support local needs Therefore, as the local authority, Wiltshire Council needs to have exhausted all brownfield options in the Trowbridge area before it considers Greenfield sites for development purposes. Then and only then, should Greenfield sites be considered as an exception to Government policy. There are many unused brownfield sites in and around Trowbridge that should be considered for development, long before we need to concrete over this Greenfield site. The old Bowyers site and old Council Offices site in Trowbridge are ready examples of this but there are many, many more. Furthermore, following the UK’s exist from the EU, Britain will need all of its land to feed its people. We won''t be able to rely on imports in an unstable world. Major agencies like the NFU and DEFRA are already expressing concerns regarding the levels of productive farmland currently being sold off for development purposes in the UK. We are already aware of the beginning of food shortages and price increases in the UK just because of bad weather in EU countries. I would urge you not to sacrifice more farmland for opportunistic housing developments like the one being proposed by Gladman. Core Policy 1 - Southwick is a village with very limited infrastructure, employment and general services and should be considered unsuitable for large scale housing developments because it would put already inadequate services under even more pressure This would fall contrary to Core Policy 1 – par; 17 of the NPPF and does not meet the housing needs of Southwick. Southwick simply does not have sufficient infrastructure in place to support this large-scale development. The Government has stated that before building in an area the infrastructure has to be in place before further development takes place. Southwick’s existing utilities are already over stretched. Without doubt, this development will put extra pressure and may even break existing infrastructure. Higher capacity sub-stations, more or bigger gas pipes and sewerage waste pipes will no doubt be required, leading to digging up of the roads and general disturbance for existing residence. West Wiltshire District Plan U1a - Advises that development will only be permitted where adequate foul drainage and sewerage facilities are suitable or arrangements made for their provision. Has any consideration been given to upgrading existing sewage and waste water systems as part of Gladmans proposal? The existing sewers are failing, degrading and collapsing due to the material of which they are made. In addition, Residents in the homes built on the old Mowlem site are already experiencing major issues with wastewater and drainage. Wessex Water have already provided me with a clear statement that before any further developments could take place in or around Blind Lane; both sewage and drainage systems would require significant investment and modernisation to cope with the increased volumes. Core Policy 60 – Advises the Council to use it’s planning and transport powers to reduce the need for travel, especially by car. This in conjunction with Core Policy 61 advises that new developments should be located with this in mind. Also to encourage alternative sustainable methods of travel (i.e. walking, cycling and by buses/public transport). On the proposal, there will be 140 new dwellings. If there is an average of 2 new cars per household, there will be c 300 additional vehicles using Blind Lane/Wesley Lane & C234 Wynsome Street/A361 Frome Road on a regular basis. This hardly complies with Core Policy 60. As there are no designated cycle-ways in the area and bus travel is not a viable option for many as buses do not run a service post 17:00 each day, I fail to see how this proposal will ever comply with Core Policy 60. As Blind Lane is nothing more than a single carriageway at best in places and would not support the higher volumes of vehicle traffic this development would cause and not be without serious issues. Blind Lane is already being used as a rat-run by speeding traffic. This often includes Freight/Heavy traffic that travel through Wynsome Street and the centre of the village every day, to and from the White Horse Trading Estate at Westbury, because they are unable to use the roads through Westbury due to the height and weight restrictions. Wiltshire Council will have to impose parking, weight and speed restrictions in Blind Lane if this development is allowed to proceed. Full consideration should also be given to the increase volume of vehicle traffic on local roads due to the additional c3000 new homes being built in Yarnbrook and West Ashton. At an average of 2 cars per household this would introduce 6000+ vehicles onto local roads that are already struggling to cope with existing volumes. Access from the Yarnbrook towards the A361/Frome Road would impact Southwick. Even more reason for an EIA to be undertaken on Redrow’s proposal. Increased noise and air pollution from additional traffic should also be considered and the impact these will have on existing and future residents of Southwick. The impact of this on resident’s health and well-being needs to be fully considered, given the Governments recent findings regarding the link between traffic pollution dementia and chronic respiratory diseases. Southwick only has a small Primary School, which I understand is already oversubscribed. There are no Secondary Schools in Southwick, the nearest being John of Gaunt or Clarenden in Trowbridge town. The location of the nearest secondary schools is a concern as they are a long walk for students when carrying their school equipment, especially for those children not in a position to either get the bus or lucky enough to get a lift. This will further congest pavements, especially along busy Frome Road at peak pedestrian flow. As mentioned earlier the demand on the roads for vehicles at these times will already be high leading to conflict at crossing points -both official and unofficial. This issue will be intensified at periods of inclement weather and during reduced daylight hours There is one small shop in Southwick that operates as a newsagents/grocer. We do not have a post office. There are no medical facilities in terms of GP’s Dentists, the nearest being Trowbridge that generally are all already oversubscribed. Nearest hospitals are in Bath, Swindon or Bristol, although Trowbridge does have an Accident and Emergency centre. Southwick only has one pub and only two places of worship With only a part time irregular bus service operating in Frome Road only, there are virtually no public transport services in Southwick. Sketchy public transport services do not run in the evenings making access to entertainment in Trowbridge, or Frome difficult. Use of a car is essential for this. Core Policy 67 requires all new development to include measures to reduce rainwater runoff and improve rain water infiltration to soil and ground. What measures are Gladman proposing to eliminate the risk of additional flooding? None that I can see based on their proposal to-date. Evidence of this was presented to the Operational Flood Working Group on 19th Jan 2017 by the Save Our Southwick Action Group. Southwick already has serious issues with flooding, although the various agencies do not seem to have any record of this. The Lambrook on the site is on a well- known floodplain. I have frequently witnessed flooding in these fields and within some of the housing surrounding them, especially during autumn winter and spring. This water will have to go somewhere. Existing plans are therefore grossly insufficient. Surface water from the site pumped back into the brook in this area, would just cause more flooding in Wynsome Street and Chantry Gardens. Application 13/02007/OUT being a property on the corner of Blind Lane/Wynsome St. was recently refused planning by Wiltshire Council, due to the level of existing flooding in the area. 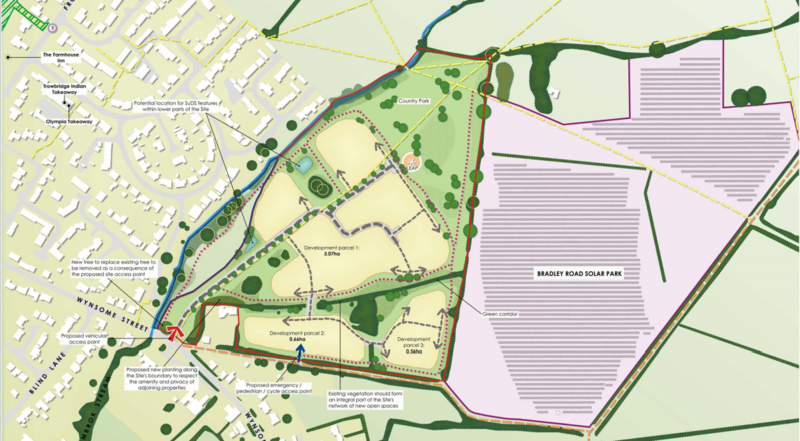 If Gladman’s proposal for development is to be allowed, then they should submit revised plans to drastically reduce the risk of flooding to the satisfaction of residents most likely be impacted by flooding. Also Gladman and/ or the existing landowner should also be made to set aside funds in order to compensate future flood victims in the village should such anti flooding provisions fail. There have been outline applications to build on this land in the past, all of which have been rejected by Wiltshire Council. UK targets for new house building are likely to be revised down as Brexit bites and this fact needs to be considered. Government policy looks to be set at repatriation of EU citizens. Major recruitment agencies (Staffline) have publicly stated that as the pound loses value, foreign workers are returning to their home countries, stating they no longer feel wanted in the UK following our Planning_Decision to leave the EU. This is especially true for blue collar, construction and lower grade employment categories, of which Trowbridge has a high demographic. Impact on Wildlife and habitat. This site supports an entire eco-system resulting in an abundance of wildlife, including Deer, Birds of Prey, Foxes and Badger. It also supports rare and endangered species, including Water Vole, Newts, Slowworm, Bats, and Kingfishers, nesting Egrets, nesting Buzzards and nesting, nesting Golden Crowed and Ruby Crowned Kinglets. I am concerned that a full EIA has not been undertaken on this site, especially as there are two other large scale proposals for house building in the village. Lack of Public Notification in the area and notices have not been posted on all entrances and exits to and from the site, which is a contravention of law. Many people in the village are still totally unaware that a development is being proposed on this site. This is completely unacceptable. I have very grave concerns regarding Gladman’s proposal. It does not bring with it any tangible benefits for the village, existing residents or future residents. The proposal is therefore detrimental to the integrity of the village and clearly the proposals aims need to be thoroughly questioned. I trust that Wiltshire Council will support its people and stand by its core ethical principles in this matter. In this respect I urge you to fully reject this proposal from the speculative operator Gladman. Sometimes to achieve planning success we have to go the ‘country mile’; this can mean finding a unique specialist consultant to address a technical issue, pioneering innovative planning strategies, or where necessary challenging or defending appeal Planning_Decisions in the High Court or Court of Appeal.